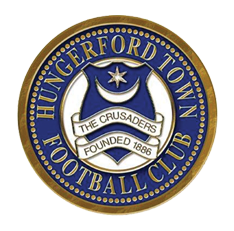 ‘With the team I support Oxford City, not in action until Tuesday evening, myself and my young son took the opportunity to make our first ever visit to Bulpit Lane, Hungerford on Monday night for the Vanarama Conference South fixture between Hungerford Town and Weston-super-Mare. Due to our unwitting positioning in the ground we where to witness at close quarters the unsavoury events that unfolded and they prompted me in to writing to say how proud you should be of your supporters for showing remarkable restraint in the face of the severest of provocation from a large group of lads purporting to be followers of Hungerford Town. The racial abuse directed at your number eleven was unacceptable and I find myself writing this with great sadness as I believed that behaviour such as this had largely been eradicated from the game. Your fans dealt with the issue in exactly the right way by bringing it to the attention of the stewards on two separate occasions and can not be held responsible if said officials chose not to act. Whilst there can be no excuse for reacting with violence I guess everybody has their tolerance point. I was leaving the ground at the same time as a large number of your followers and once more they did incredibly well not to react to the another gathering of the lads who had not been dispersed and gathered to attempt to goad the Weston-super-Mare fans in to a confrontation. You often hear bad things about fans and it is very rare that commendable behaviour is reported. Hence why I wanted to contact you to thank them. One can only hope that the powers that be will deal with what happened and that your fans will not have to be on the receiving end of behaviour such as this in the future.